Hello all, how are you doing this Thursday? I'm looking forward to maybe some warmer spring days this weekend. Last night I got back from a stressful day of work and laid down for a 30 minute power nap which turned into over an hour because my boyfriend didn't wake me up! I was going to go the gym but felt really awful and groggy so instead made a quick dinner and stretched and foam rolled. I felt really guilty but am working on listening to my body. If I can get a good night sleep tonight, I can work out tomorrow and crush it! Remember to listen to your body, people! Without further adieu, here is another bunch of things I'm loving this Thursday! I rediscovered this album this week and have been obsessed. They have beautiful harmonies and sweet lyrics. I especially love the acoustic/live version of this song. This by itself, or with an apple, or on a van's gluten free apple cinnamon waffle has been my go to snack this week. I must show self control because it is so tasty! It is one day from the weekend so you should be smiling today! I slept in instead of hitting the gym in the AM because I need my sleep (and need to stop staying up so late at night). Anyways, here are some random musings for this lovely Thursday. I had just jumped on the Google Reader bandwagon when I got the notification that it was being discontinued in July. Thanks to the wonderful blogging community, I hopped on BlogLovin' which let me import all the blogs from Google Reader and voila! It's super clean and easy way to scroll through blogs I like and click on posts that interest me so check it out and please follow me through the link below! Click HERE to follow me on BlogLovin'! The boyfriend decided that for our anniversary he wanted to gift me a pair of custom sneakers, after I hinted on Valentine's Day how awesome they were and that he shouldn't have made me so many chocolates! New Balance, Reebok, and Nike all allow you to customize sneakers online (for a price! ), but I think since I'd probably never splurge on the Nikes that I'm going to go with them in a super flashy teal and hot pink color scheme. Check out custom Nikes here and let me know any suggestions you have! Anybody have an experience in the Nike Frees or Nike Lunarglides? I mostly run, but I'd probably wear these sneakers for short runs or the gym because I'm so in love with my Brooks PureConnects! 3. You need to get to a Trader Joe's right way and buy five bags of these. These roasted coconut chips fuel my coconut obsession and are so delicious. They are great in trail mix, on oatmeal, or buy themselves. Sadly the bag is only two servings (Okay, actually one serving for me) so stock up! Last week, my guest blog for Becca at Diary of a Slow Runner was published featuring two quick and healthy snack recipes that have been satiating my sweet tooth as of lately. Go check out my post and look at all the great posts on Becca's blog! 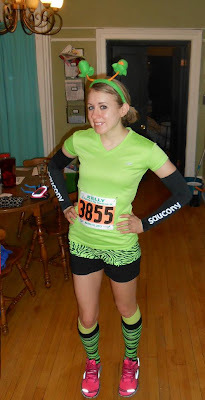 Tomorrow look out for a recap of my third half marathon which included a surprise! Congrats to my first EVER giveaway winner Debbie Harris! 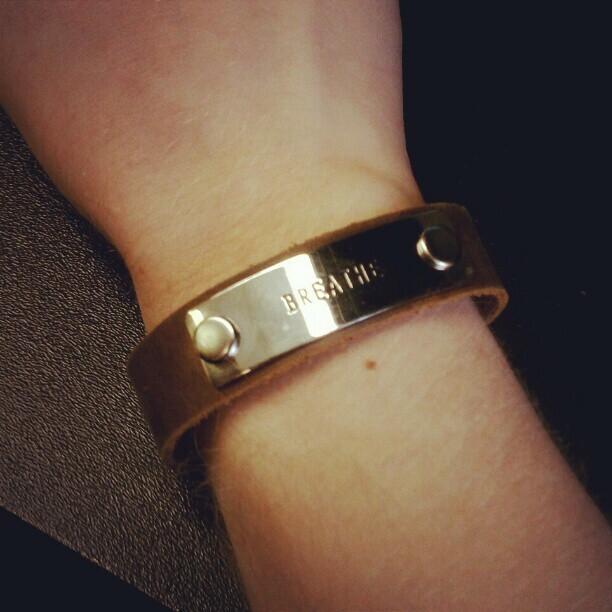 Please email me at breathedeeplyandsmileblog@gmail.com so I can get some information to get your bracelet sent on its way! Thanks everyone for supporting the blog and entering! 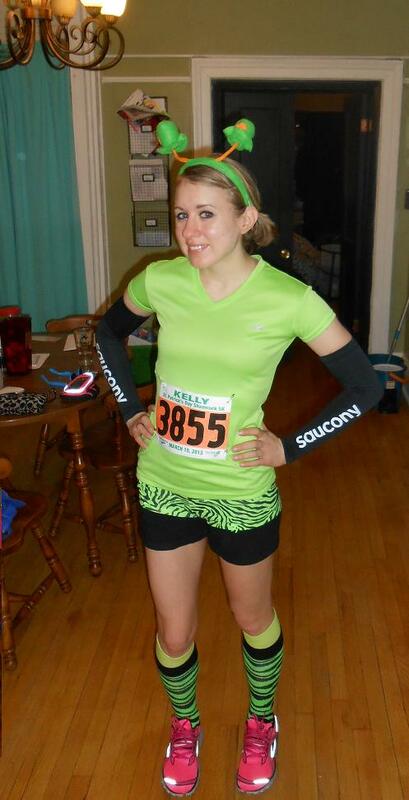 My ‎2nd race of 2013 done with a new PR at Baltimore KELLY Shamrock 5K. My PR of 21:22 this past Sunday was a really exciting way to end the weekend. It's funny because my 5K PR was this race last year, and I was totally not expecting to break it. The KELLY Shamrock 5K is a super fun race that happens right before Baltimore's St. Patrick's Day parade. People are already lined up for the parade so there is automatically a nice-sized audience to cheer you on. The race start time was at 1:15 in the afternoon. Late race starts always throw me for a loop because I have time to actually do things before race. It also was the day post daylight savings time switch which had me thrown off anyways. I slept in and went and had a large brunch with my boyfriend. The race was only a couple minutes from my apartment so my warm-up jog was to the start line. Last year was my first year running the race, which always sells out, so I wanted to get close to the starting line. There was still a bunch of people in front of me, but I managed to get off to a speedy start just like last year. 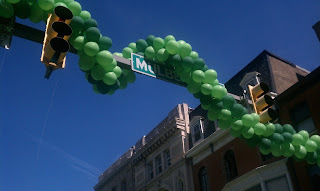 You couldn't ask for a better day with sunny skies, warm temperatures, and a mass of runners in neon green shirts. After running longer distances, a 5K felt so short! My first mile was around a speedy 6:40 so I keep the pace a little over 7 minutes for the rest of the race and had very little gas in the tank to push it at the end. I was so happy to see the finish line! Once I was done, I immediately went and grabbed my free beer at the end of the race. It officially marked the first time I felt like Spring was actually on it's way! I'm really excited today because it is my first blog giveaway EVER! Please enter and make this awesome for me and win a really cool bracelet. Endorphin Warrior is a company who's goal is to encourage both athletes and non-athletes to live healthier, more productive, and positive lives through their products with exercise and positive thinking. They have all sorts of jewelry such as bracelets, rings and also pendants and dog tags which are stamped or printed with an encouraging and positive word such as "Strength", "Focus", and "Conquer", just to name a few. I chose a bracelet with the word "Breathe", because it goes with the theme of my blog and because it is what I am trying to focus on in my life now. I think such a simple word and message that more people need to be reminded of! Breathe, calm down, and focus on the day. Breathe when you run and release all that air and negative energy with each stride. Besides the fact that the products encourage positive thinking, which I love, they are also meant for active and healthy lifestyles. I wore my bracelet all day, even through exercising, which gave me a lot of focus whenever I looked down at my wrist. Endorphin Warrior is also doing something really cool for the month of March by sponsoring a month-long donation drive for the Orangethorpe Elementary Running Club which provides a positive after-school environment for lower-income children. Throughout the month Endorphin Warrior is donating $1 from each online sale to the club and will also provide each member of the Orangethorpe Elementary Running Club with a tee shirt, race entry for a local 5K, and merchandise as rewards for achieving certain milestones. Besides feeling great about supporting such an amazing cause, Endorphin Warrior will also give everyone who places an order between March 1st and the 31st a free dog tag/key ring valued at $15 with the buyer-selected keyword. I'm lucky to be able to offer a warrior training bracelet to a reader, thanks to Endorphin Warrior. The giveaway will be open until Wednesday, March 13 at 11:59 pm EST. I'm keeping it simple so to enter,comment and tell me what positive word you'd like on your bracelet (must choose from the options listed for Warrior Training Bracelets in the link below)! All the Warrior Training Bracelet options can be seen here. Thank you so much, Endorphin Warrior! Disclosure: I received the Warrior Training Bracelet at no charge from Endorphin Warrior and no monetary compensation was provided for this post. All opinions are my own.